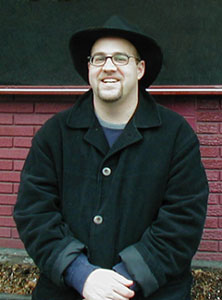 David Louis Edelman is an author, blogger, and web programmer who has recently completed his first science fiction trilogy. Here he talks about the Jump 225 series, what he finds pleasurable and not so pleasurable about writing, and discusses his gaming background where he boasts — rather unrealistically — about his skill at playing Yars’ Revenge. Could you please explain what your Jump 225 trilogy happens to be about? 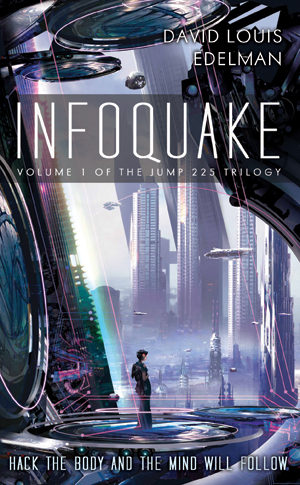 The Jump 225 trilogy is three books — Infoquake, MultiReal and Geosynchron (the last of which has just been released by Pyr). It’s a story set about a thousand years in the future, where you download software that runs on nanobots in the human body. So you can download a program to cure a disease, or focus your vision, or even show a specific expression on your face. The story focuses on a group of software entrepreneurs as they try to bring a radical new technology to market. I’ve heard some good quick phrases for what the trilogy is about. There’s “Dune meets the Wall Street Journal,” “Neuromancer meets Wall Street,” “the love child of Donald Trump and Vernor Vinge,” and (my personal favorite) “Boston Legal meets The Matrix.” I tried to really find the excitement in the business world and focus on that, rather than just use it as a jumping-off point for your typical action thriller. These are probably the most exciting books ever written that climax in marketing demos and government hearings. Would you mind describing what the process was like for you in getting your first book published? Like most published authors, my story was pretty excruciating and involved a lot of luck. After I finished the first book (Infoquake), I shopped around for literary agents. I sent two dozen queries and samples to the top SF/F literary agents who claimed to be looking for new talent, and got two dozen form rejection letters. Finally a former boss of mine, who had done some literary agenting before, offered to take a crack at getting the book published. He sent the book out to a number of publishers, and I just happened to get lucky by landing in front of Lou Anders at Pyr. From there, it was another 18 months until Infoquake hit the shelves. When I was a kid, I was a big board game aficionado. My brother and I used to invent board games on construction paper when we were kids. We made this board game where we recreated the whole map of Disneyland, complete with a pop-up Skyway and replica ticket books. Later on in my early teenage years, I was into AD&D — but for me, it was mostly a reading experience, since I never found a like-minded group of serious players. I also had a whole collection of Avalon Hill games that never got much use, unfortunately. My board gaming and RPG experience pretty much ended in high school. On the electronic side, I was a serious Atari 2600 and Colecovision addict as a kid. But my experience with console gaming largely died in the big videogame crash of the early ’80s. I’ve done a fair share of computer gaming in the years since. In college, I was big on the Infocom games (Zork, etc.) and stuff like King’s Quest and Space Quest. Since then, it seems like I pick up a new game every two or three years and just play it over and over again, long past the point when I should be bored with it. I’ve lost serious amounts of time to Civilizations I through IV, Starcraft, Diablo, Master of Orion, Neverwinter Nights, Return to Wolfenstein and Star Wars: Jedi Academy. For some reason, I’ve never cared to game with real people. I just like to play against the CPU. So that’s limited my exposure to online worlds. I played around with Second Life for a little while, but I didn’t really see the point of it. Seems like a fabulous idea that has utterly failed to pan out once you actually log on. And believe it or not, I’ve never even seen World of Warcraft. In junior high school, my group of friends and I decided to say goodbye to RPGs by playing a raucous game of Chutes n’ Dungeons n’ Ladders n’ Dragons. It was a pretty lousy gaming experience, but it was fun to play Dungeon Master and describe all of the neon-colored stuff on the Chutes n’ Ladders board with a corny dramatic voice. I also find it interesting and amusing that I tried to create an RPG version of “Guitar Hero” 20 years ago, long before the technology was around to do anything like that in pixels. I sent an unsolicited proposal to TSR and never heard anything back. Somewhere out there is an alternate universe where I’m so wealthy I’m using hundred-dollar bills for napkins. Absolutely. I’m known as something of a worldbuilding addict — the world I created for the Jump 225 trilogy not only has religions, political parties, a banking system and business regulation, but a shipping system and futuristic building materials too. It’s much easier to think that way if you’ve got a gaming mentality, because you’re constantly thinking in terms of cause and effect. The Civilization games have taught me a lot in that regard. I’m constantly trying to think a few turns ahead of my characters, to set things up that I might use in the future, to think about characters in terms of resources to be used and points to be scored. Yes, unfortunately, writing is not exempt from the grind. For me, it’s a huge part of the process. I tend to rewrite and rewrite and rewrite, then reread and reread and reread. It can get tedious at times, but when you look back over what you’ve accomplished it’s definitely rewarding. I didn’t make things easy for myself by having so many things to keep track of. For instance, in the Jump 225 books, there’s a virtual communication technology called “multi” which lets you project a virtual body into real space and interact with other people as if you’re actually there. So for every scene in all three books, I had to keep track of which character was present as a real body and which character was present as a multi projection. Definitely gets tedious the 45th time you do it. Hearing from the fans and the readers. And I’m not just talking about abject flattery (though that can be rewarding in and of itself). I enjoy reading reviews and discussions and emails from people who are really engaging with the books, even if they dislike parts of them. As long as they’ve taken the books seriously and not just as mindless entertainment, I’m happy. A couple of critics have even shaped the content of subsequent books to an extent by making criticisms or bringing up issues that I’ve overlooked. There’s a crucial subplot of Geosynchron that really only came together after I thought long and hard about the criticisms in one particular review. Mostly at night, after the babies go to sleep. Which is why I really have no life. And also why it takes me so long to get any writing accomplished. I used to escape by immersing myself in books and films. Before I started writing, I was a serious two- or three-book-a-week reader, and I tended to watch my movies very seriously, on a big screen on Blu-Ray and full digital sound. But since becoming a parent, I’m afraid I’ve found it too difficult to concentrate on reading for any extended length of time. Instead I tend to just browse the web too much. I wish I could say that I was reading deep, intellectual things on the web, but instead I spend too much time on the Onion AV Club and Reddit. You have to be prepared to never be published, and even if you *do* get published, to never be appreciated. There’s a huge amount of luck in this business, and the number of deserving authors who actually get recognized for their work is minuscule compared to the total number of deserving authors. The only way you can deal with that it is to have this zen-like sense that it doesn’t really matter in the end whether you’re successful or not. I’m also fairly convinced that the Apple iPad and the Amazon Kindle are the harbingers of a very big shift in the publishing industry. Right now, novelists are very much subject to the whims of the big bookstore chains. But within 15 years, I think, having a big New York publisher isn’t going to matter nearly as much as having a dedicated online following. So I think the best thing a budding writer can do is to network, join online writing and reading communities, build up your Facebook friends and Twitter followers. And just keep writing. You wake up to a world where your Jump 225 trilogy has been made into a role playing game. What character and class would you play and why? I wouldn’t mind being one of the Lunar tycoons, who are very much the people pulling the strings behind the scenes. Who wouldn’t want to be able to manipulate people from afar for your own self-gratification and not worry about the consequences? I’d like to remind everyone that Infoquake, MultiReal and Geosynchron are now available in bookstores across the country. And if you can’t find them in the bookstores, you can order them from a zillion different online vendors. You can read the first seven chapters of Infoquake on my website at www.infoquake.net if you want to get started right away. 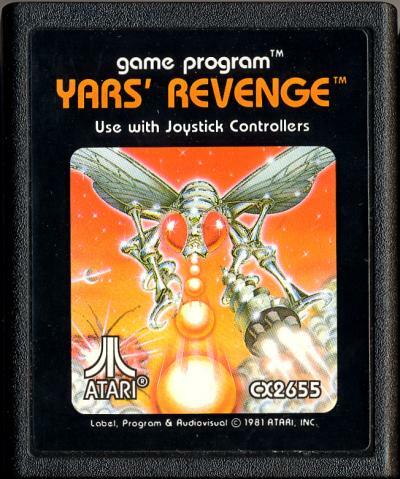 I would also like to point out that back in the day, I could kick all of your asses at Yars’ Revenge. This entry was posted on February 22, 2010 at 5:43 pm	and is filed under Uncategorized. Tagged: Author interview, David Louis Edelman, David Louis Edelman interview, Reading the text, Science fiction. You can follow any responses to this entry through the RSS 2.0 feed. You can leave a response, or trackback from your own site.